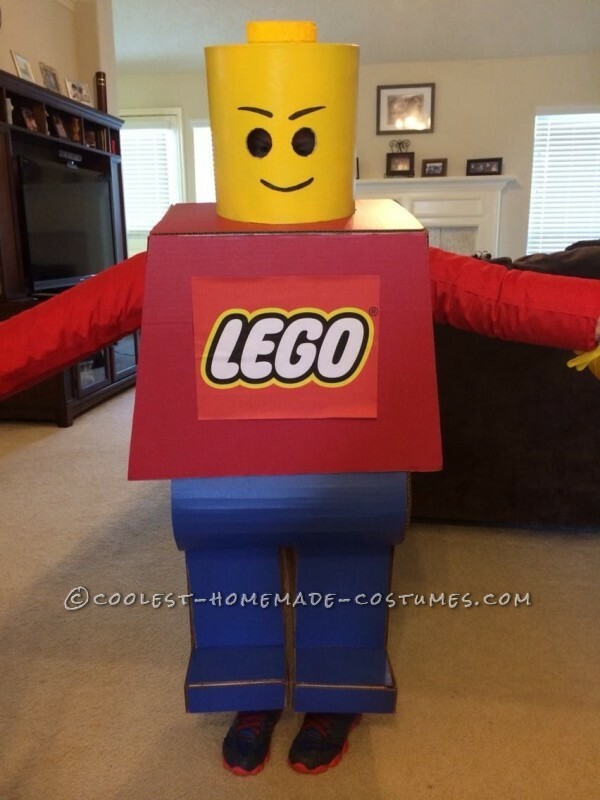 My son has been building Legos since he was around three and a half, it was no surprise that sooner or later he would want to be a Lego figure for Halloween. This year, I started asking him in September what he wanted to be dressed as. I showed him a Party City catalog and nothing appealed to him. 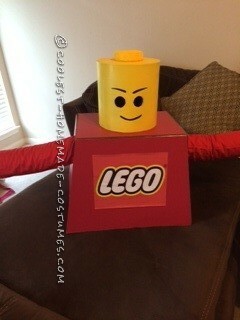 He then had the idea to be a “Lego Man”. 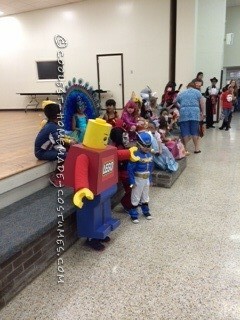 Of course, no Lego Man costume to be found in any catalog or online for that matter. We tried to talk him out of it, I was pushing for a blue ninja (saw plenty of those for sure). But no, he stood firm and said “Lego Man or nothing”. 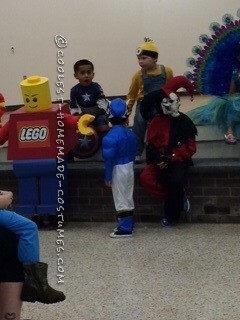 He didn’t even want to trick or treat unless he was in his Lego costume. This is where our story begins. 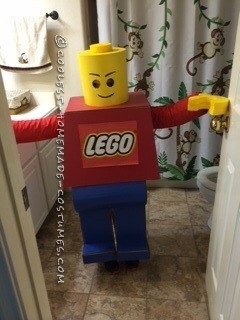 I googled homemade Lego Man costume. Saw plenty of good tries, but nothing was standing out to me as close to perfect. I finally came across ProjectDenneler.com. This looked good and I thought doable. I showed it to my husband at first, he said “no, too much work”. But my son and I begged him to give it a try and he relented and gave in. The first step was to find the supplies, we bought almost every item at Hobby Lobby. We had to buy blue and red trifold presentation boards first. My husband then started measuring my son and figured out what cuts needed to be done. We used packing tape to hold the pieces together. Over the course of a month, we made several trips to two different Hobby Lobby locations. The head was a challenge for us, my husband didn’t want to use any plastic containers in thinking that my son couldn’t breathe properly. It was during a trip to the store to get the Lego hands that we went down the aisle where the cardboard containers were, and found a box that could be used! My husband wanted to cover it with yellow fabric so we bought a yard, and a yard of red since we knew we would use it for the arms. That’s when we headed to Home Depot to get the dryer hoses for his arms. My husband had to also measure and cut those to fit. The costume was coming along, I measured my son for suspenders used to hold the pants up. I used hot glue to secure them. He tried the pants on, he kept pulling the suspenders up on his shoulders. I knew I had to fix it since I didn’t want him to be worried with holding up the pants, so I sewed Velcro on both the suspenders and his white undershirt. Once we started trying on the body, we knew the packing tape wasn’t strong enough so we used gorilla tape from Home Depot. I covered the arms with the red fabric and used hot glue to secure them. The hands is where we ran into the most trouble, come to find out you can’t use regular spray paint on Styrofoam (it eats through it). We bought double the amount of six inch Styrofoam circles and used Krylon short cuts paint that did a better job. We also couldn’t find any yellow fabric kid gloves, luckily I thought to look while at Target in the costume section and I found white princess gloves that I knew I could dye yellow. Of course I had to remove all the princess parts before my son came home from school! All that was left was to hot glue the hands on the gloves and they were ready. The head was the last thing we worked on. I tried several times and ways to get the fabric to be taut on the box and nothing was working. So I decided to use the same paint we used on the hands. The top of the head we used a small circle of Styrofoam also painted yellow, and hot glued it on the top. The day before the high schools costume contest, my husband cut out the circles for his eyes and used a Sharpie for the smile and eyebrows. We were ready! Monday, October 27th was the La Porte High School haunted high. They do this every year and it’s a lot of fun. The children can go with their costumes on and trick or treat down the hallways and they have games and a costume contest. We knew we wanted him to be in the contest, and he did too! He entered in the contest for three to seven years olds. He was so patient and didn’t complain at all while waiting. He won for the most creative! 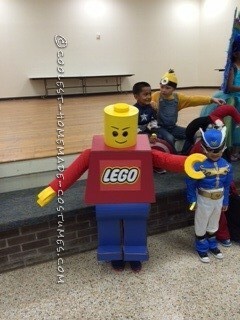 The best part is when we were done with the night, he said, “mommy, give me a high five since I had the idea to be a Lego man”! The experience for us as a family was awesome! 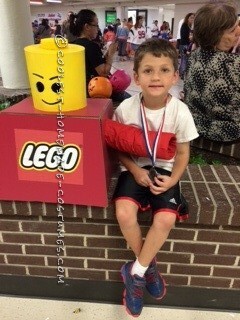 It was worth all the hard work to see the smile on my master Lego builders face.